Where is the Global and Local Stock Markets is Heading? What is the Current Market Outlook and the Best Stock Picks? Bursa Malaysia acknowledge the importance of information-based investing for the retail investors by organizing Market Chat 2009. We all know that Smart investor is an Informed and Wise Investor. The Market Chat 2009 main purpose is to educated the public on making the best investment decisions to attain consistent and Good returns. It also aimed at engaging and educating the public on investment opportunities in Malaysia and the available products. The series has entered its third year, attracting more than 7,000 participants. This year, the interest intensifies with greater collaboration with nine brokers in 48 locations to cover 56 road shows across the country. 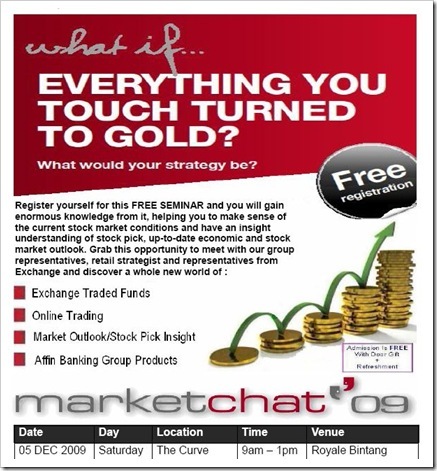 Affin Investment Bank would like to invite you to attend a FREE seminar – the “Market Chat By Bursa Malaysia – AFFIN 2009/2010”. The “Market Chat By Bursa Malaysia – AFFIN 2009/2010” is a roadshow event organized by the Bank in collaboration with Bursa Malaysia as a continuous efforts to provide you with the best trading and investment strategy updates. · What is happening in the global markets, and how it is affecting us? · What will be the market outlook & stock picks? · How to have a competitive edge using online trading? · Where should we be putting our money? · When should we be safeguarding our money and when should we be investing? Admission is FREE for the above seminar where door gift and refreshment will be provided. You are more than welcome to bring along your friends and / or relatives to this event. There will be a of showcasing Bursa Malaysia Exchange Trade Funds, Affin Investment Online Trading Portal, Affin Bank Conventional & Islamic Mortgage, Unit Trust, Deposit, Corporate & Investor products & services. Kindly contact Affin Investment Bank’s helpdesk support at 03-2143 1113 to confirm your participation or for more information. Through this Market Chat 2009 event, retail investors gained deeper appreciation of the current market scenario as they get first-hand information from qualified experts in the investment arena. This entry was posted on Saturday, November 28th, 2009 at 1:01 am	and is filed under stock market. You can follow any responses to this entry through the RSS 2.0 feed. Both comments and pings are currently closed.